I'm very grateful to the friend who recommended Swinsian as a replacement for iTunes (thankfully its pretty yellow icon is more memorable than the name). When it comes to "it just works" (which used to be the Mac way) then the team have it sussed. 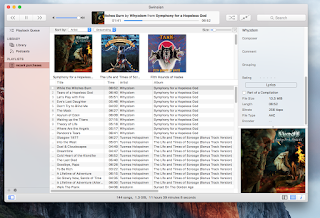 It was incredibly easy to import my music, with no appreciable disk space used. it just built its own library leaving the files where they were, which is exactly what I wanted. (I noticed later a Preference which allows copying of music into Swinsain's music folder). Plus it watches the music folder and just adds anything I buy via or add to iTunes. Using Swinsian is such a zen-like experience. It's so nice to have a music player that only handles music. It does podcasts too (which I've switched off). But I hope they're not tempted to start adding more stuff and allowing it to become the nightmare that is the current iTunes. I keep discovering nice little touches, like the 'animated dock icon'. It's no more than a dot that moves as a progress indicator, but that's really neat. Buttons look like buttons! No symbols just printed on the textured surface of the window, or within the LCD display. Or words printed in an area of nothing that could equally be a field, a label or a button. The search box is nice and simple, it just filters your music in the display according to the word you type. It's like having iTunes 10 back again! There are one or two glitches - I have given up on the desktop widget which I couldn't get to work properly, also it would be nice if, when you're using shuffle, the display scrolled automatically to the track that's playing. But I'm sure these will get ironed out with time. Expect Screensleeves support very shortly!